Due to limited linguistic and technical knowledge, I do not know (and can not find) the name for the 4 pin (or perhaps 3?) plugs that are used inside PC cases to deliver electricity. What's the difference between them and "Molex" cables? Is there a converter to attach to small 12V DC adapters' round end so that I can connect / run a fan externally? These cable assemblies are typically used to deliver +5V and +12V DC to various components in the computer such as optical drives, hard drives, and fans. Molex (see Molex Connector) is the company that developed the typical connector found on the ends of these assemblies. Some people refer to the cable assembly itself as "Molex cables" but this is technically a misnomer. You can easily find adapters (pictured above) for connecting 3-pin (Molex KK-type) fans to these 4-pin connectors at your local computer store, or online. While I have not seen converters to connect DC power jacks, you can easily modify one by soldering your own power jack to it. 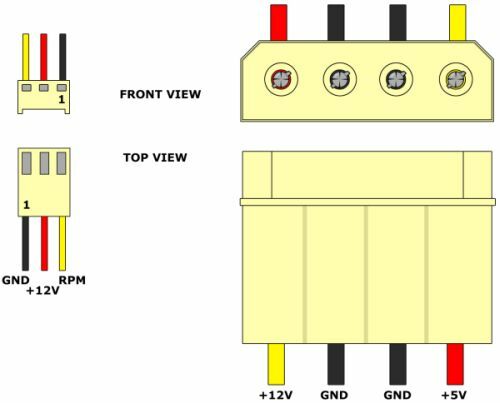 With this information you can cut the appropriate wires and solder them to a DC power jack using the correct polarity. Be sure to use your meter to verify polarity if you're not sure. What's this power supply cable called? What PSU is usually used in mini-ITX cases/chassis? What purpose has this tiny clip on my power cable? What controls the HDD spindown (power cable or data cable)? What is the power supply cable connected to most USB hubs called? What is the use of female to female SATA cable with power?